Is Hobart the main festival site or Launceston – and what are the dates? 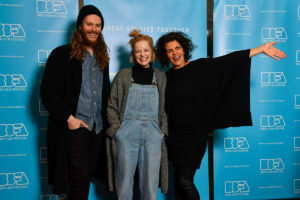 The Tasmanian Breath of Fresh Air (BOFA) Film Festival has always seen itself as a Tasmanian state festival. In recent years it has only been in Launceston with irregular events in other parts of the state. In 2019 BOFA will show 10 films in Hobart selected from the 32 films shown at the Launceston festival program. The Hobart festival runs from Friday 10th – Sunday 12th May. The Launceston festival is from Thursday 16th – Sunday 19th May. Why not come to both? When is the full program available? The full program in print and website versions will be launched in Launceston at 5.30pm the Academy Gallery (all welcome, no charge) on the evening of Tuesday 12th March and in Hobart at the Lord Mayors Courtroom at 5.30pm (by invitation due to limited space, no charge. Contact director (a) breath-of-fresh-air.com.au if you'd like to attend. How many films are being shown? We screen 32 films in all, being four (4) films in each of the eight categories of Stories of Us, Star Studded, Strong Women, World Stories, Eat/Drink/Live, Call of The Wild, World of Change and Nearest Neighbour. More details at the 2019 Programme page. Are films suitable for children? All films are rated 15 + and children can attend if accompanied by an adult. What masterclasses and action sessions are planned? Please see the TAKE ACTION page for more details. What red carpet events are there? Opening night after-party (Friday 10th May, Hobart, Thursday 16th May, Launceston), red carpet Indonesian cocktail party before screening of The Seen and Unseen (Friday 17th May, Launceston), and the 40th Anniversary red carpet party for My Brilliant Career with director, Gillian Armstrong (Saturday 18th May, Launceston). Have a look at the Red Carpet Package at GREAT DEALS or buy separately at Tickets once the program is live (12 March). Choosing your films to book is easy. View Films By Day HOBART or Films By Day LAUNCESTON or Films By Theme and view the film details by clicking the More Info & Trailer button. To book, click the Book Tickets button. You can book for one film or as many as you like. You choose exactly what you want to see when you book online, by phone or at the box office. NOTE: All films are 15+, children must be with an adult. Ticket price ranges from $16.OO per ticket to $2O.OO per ticket. These prices are inclusive of all concession rates. Booking Fees will apply to all online bookings including Vreward members. NOTE: Vrewards membership is needed to access discounted ticket prices. Sign up to Vrewards online: villagecinemas.com.au/vrewards. Make sure you are logged into your Vrewards account when making your bookings so Village can track your purchases to receive your 11th Ticket free. This can be done by ticking the “keep me logged in” box when signed in to your Vrewards page. Vrewards Tickets [10 tickets] + 1 Complimentary Ticket (Sign up to VRewards online or at the nearest Village Cinema to become a Vrewards member to receive the discounted rate. Member must login online or scan their card in store when purchasing tickets to BOFA film titles.The complimentary ticket will be applied to the Vrewards Members account 48 hours after purchasing their ticket to a 10th BOFA Film title only (must be to 10 different BOFA film titles). All Action Sessions are free admission. How can I plan a trip around the festival? Contact destinationlaunceston.com.au, hobarttravelcentre.com.au or discovertasmania.com.au.